According to a news release from the City, the reconstruction of the Beckett Drive escarpment access will remain closed until mid- to late-October. The access was closed between Aberdeen Avenue and Fennell Avenue on June 3 to rebuild the access, construct new retaining walls, improve drainage and widen the sidewalk south of the top of the Dundurn stairs. The delays are no fault of the contractor. The construction schedule was aggressive and this is a very complex project made more difficult because of the unique characteristics of the escarpment cut, slope stabilization issues and the presence of Butternut trees, which are an endangered species and required extended collaboration with the Ministry of Natural Resources. Contractor hours have been extended to get the job completed as quickly as possible, and the City plans to work with Mohawk College, Hillfield Strathallan College, McMaster University and St Joseph's Hospital to mitigate traffic impacts once school starts again. Beckett Drive normally carries 21,000 automobiles a day on just one lane in each direction. During the closure, traffic volumes have been high on the nearby James Mountain Road access, but the other accesses, including the Jolley Cut and Claremont Access, remain free-flowing even during rush hour. This stuns you?? It seems that when yokels-i mean staffers- need to design streets in hamilton, they go down at "rush hour" to count cars and when they run out of fingers and toes they determine the answer is "alot [sic]" and proceed to follow "400 series design principals [sic]" in order to make sure there's no "gridlock". Here's a question... how many travel lanes cumulative across all accesses does hamilton need? Since these cuts were made we've installed two fully separated highways. What if we cut all the inner city accesses to one lane up and one down? Answer: no mayhem and safer streets for all. But we'd no longer be able to move "alot" of cars. I think we're seeing the answer to that question with the closure of an access that carries 20,000 cars per day. The Public Works guy - Gary Moore - was on radio today and said the Claremont and Jolley Cut still have tons of capacity to handle anyone still looking for the quickest route. So in other words, we can remove a 20,000 car road from our network and be just fine. Granted, it is a needed link between west Mtn and West End so I'm not sure permanent closure is the answer, but certainly we should have no problem taking a full lane on the Claremont for a separated 2-way bike lane from Mohawk College all the way to Burlington Street, and another 2 full lanes for LRT tracks. We should also narrow lanes on the Jolley Cut to provide bike lanes ALL the way up and down. Ditto for the new Queen St Hill. I should also add to my comment above that the Claremont has had a full lane closed since the rockslide a year ago. So, we've taken away a 20,000 vehicle mtn access AND an entire lane of the Claremont, yet the Claremont and Jolley Cut have tons of extra capacity still. Anyone know why they widened the sidewalk only halfway down the jolley cut? Some reason they didn't go all the way? And I agree pointless to have an up lane (which is a challenge for casual cyclists) but not a down lane (which would be easy for all cyclists to use). That said, they recently introduced bike lanes on a 10 block stretch of Queensdale on the mountain (between U. Wellington and U. Wentworth) and I can't for the life of me figure out what their purpose is since they're not part of a larger network of cycling infrastructure. It would be great if they connected to cycling lanes on wentworth to go up to limeridge, or down to concession, etc. but as it is, a 10 block stretch of bike lanes on a street that previously was wide enough for cyclists to safely ride beside cars, well...it just seems like it was set up to fail, so they can say "oh, we tried, no one used it". The Queensdale bike lanes were originally part of the city's Cycling Master Plan. A few years ago, Councillor Tom Jackson vetoed the bike lanes in his Ward 6, which runs east from Upper Sherman north of Mohawk. His reasoning at the time was that if people want to ride a bike, they can ride on the city's recreational trails. I've sent an email to Daryl Bender, the city's alternative transportation manager, to ask for more details about the installation: where it runs, what it connects to, whether the section east of Upper Sherman is still vetoed. Update: I got a response from Daryl Bender. Apparently the bike lane runs from Upper Wellington Street to Upper Wentworth and is being treated as a "pilot project to assess whether to continue bike lanes easterly to Upper Sherman Ave."
He also confirmed that the bike lane in Ward 6 is still vetoed by Councillor Jackson, so it won't be continuous. 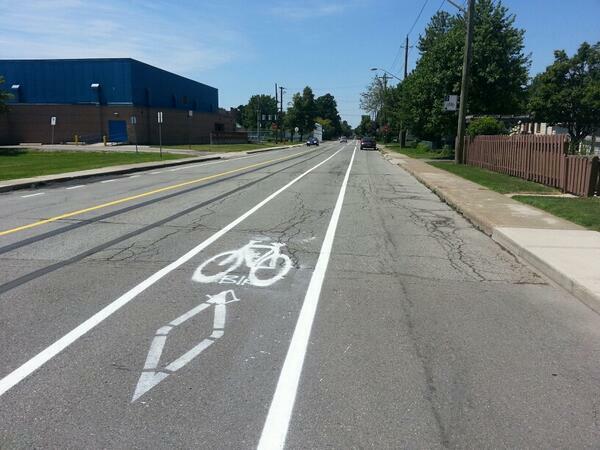 However, there are plans for bike lanes on Upper Wentworth, which crosses the Queensdale pilot. As a follow-up, I've asked what the City will consider to be success in the Queensdale bike lane pilot project, and what will happen if that threshold of success is not met. FYI the City has a Building the Bike Network site to look up the status of the various project. a pilot project?? What exactly are we piloting?? Bike lanes exist all over the world. Hamilton is hilarious sometimes. I see that the electronic sign is still saying "September." Was at the Pool at Inch Park yesterday between 5 and 7pm. While watching my daughter I did a "yokel" count of bikes riding on it; 73 mostly teens.